Metered connections is one of the features of Windows 8 which was not present in Windows 7 or earlier Operating Systems. This setting has been a life saver for me several times. Through metered connection, I can choose whether Windows system should use the Internet resources or not. We can limit the Internet bandwidth used by Windows 8 or later Operating Systems through metered connection settings. If you are a power user, you must have seen a process svchost.exe (netsvcs) using your Internet bandwidth. 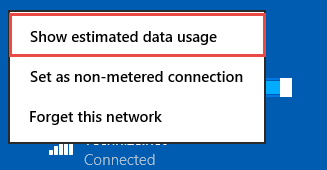 This may be stopped by setting your connection as a metered connection in Windows. 1 What does a metered connection do? What does a metered connection do? Apps downloading from Windows Store will be paused. Start Screen tiles will stop updating live data from the Internet. Offline files will not synchronize automatically through the Internet. 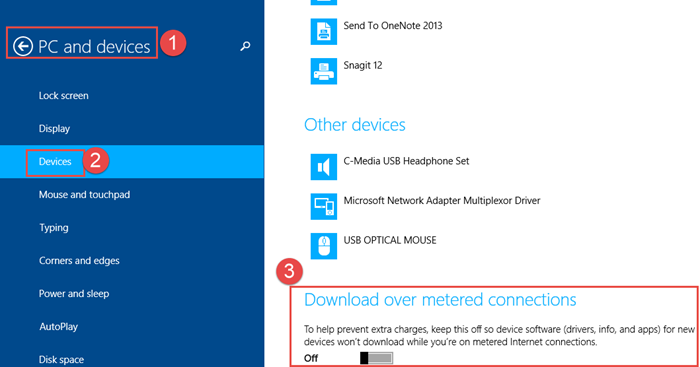 Configuration settings of metered connections are almost the same in Windows 8, Windows 8.1 and Windows 10. The screenshots in this article are taken on a Windows 8 PC. Set the “Set as metered connection” setting to On. To disable the metered connection setting on any network connection, just follow the same steps and at the last step, just set the metered connection setting to off. Please note that Ethernet networks can’t be set as metered connections. You will need to have a wireless connection to set it as a metered connection. There are a few settings you can configure to save more bandwidth than the default settings. On the right hand pane, under Sync settings, turn both settings to off. 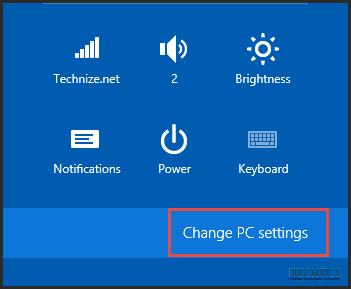 Turning off device updates will prevent Windows from downloading information for new device drivers and updating the drivers on a metered connection. Select Devices and make sure Download over metered connections is set to off. If you use Windows Search in Windows 8 or above, you will notice that it is powered by Bing as you’ll get web results along with the local search results. 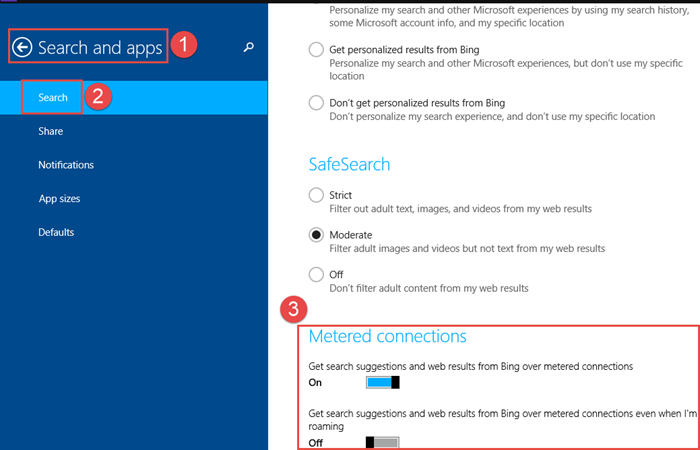 You can turn this search feature off on metered connections. 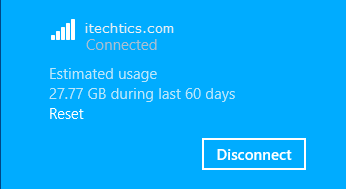 Windows provides a very basic calculation on data usage over a metered connection. It will only list down the amount of data that has been downloaded and uploaded over the connection. If you want more details, I recommend a free utility called NetWorx which gives a lot of information as well as simple upload and download data usage. I hope I have covered most of the settings of Metered Connections in Windows. If I have missed anything or you have any suggestions, we are always open on discussions in the comments below. I recently started using D-Link DWR-910 4G USB router. I use it with my Toshiba laptop. I use a prepaid Airtel SIM card with it. It works well. My only complaint is that I cannot check data usage. The EZFI app does not work for PCs and laptops. It works only for smartphones. I downloaded third-party softwares like Cucusoft Netguard and ISP monitor. These too do not work. I use Windows 8.1. The connection that I have is “Ethernet Connection” and therefore, I cannot check data usage. Ethernet connections cannot be set as a metered connections in Windows 8.1. I would be grateful if you told me of any software which would work with D-Link DWR-910 (for laptop) on Ethernet connection so that I could check my data usage. My personal favorite was Networx but it is discontinued. You can see some worthy Networx alternatives here. And if you want to go with a paid option, try out DU Meter. Another option can be BWMeter. Do let me know which one did you select. I was using windows 8, but since I formatted my system and install windows 8.1 pro. I experienced high rate of Data charges, I off almost all network services, windows update off, install anitivirus disable background intelligent transfer services, but yet the charges are still high, I lost 2.6G just to open a web pages within 2 days, I think I try all possible ways, yet the data is consuming high, if I just open a page… after 30 secs 39MB will go. I try the information above yet no success, what should I do next? Everytime I click to turn the it “on” to allow download for metered connection, it won’t stay. When I go back to the setting, it’s back at the “off” position. How can I fix this? I’m unable to install my updates because of it. For what asinine reason can’t an Ethernet connection be set as metered? It’s still costing me money the same as if I connected via wireless using the same data quota. Unbelievable. Only Microsoft could come up with that. This shouldn’t even be relevant, except Microsoft wants to track everything you do in real-time. I’m amazed that the install process doesn’t request that M$ can stick a microscopic camera into your bodily orifii, which of course, would be on by default.